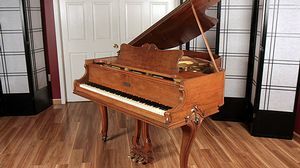 This Louis XV baby grand has a beautiful walnut case. It is currently in unrestored condition and can be refinished to any color of your choice. Includes matching bench. Serial #: 105786 Length: 5'3"